Ahem! That’ll be me! 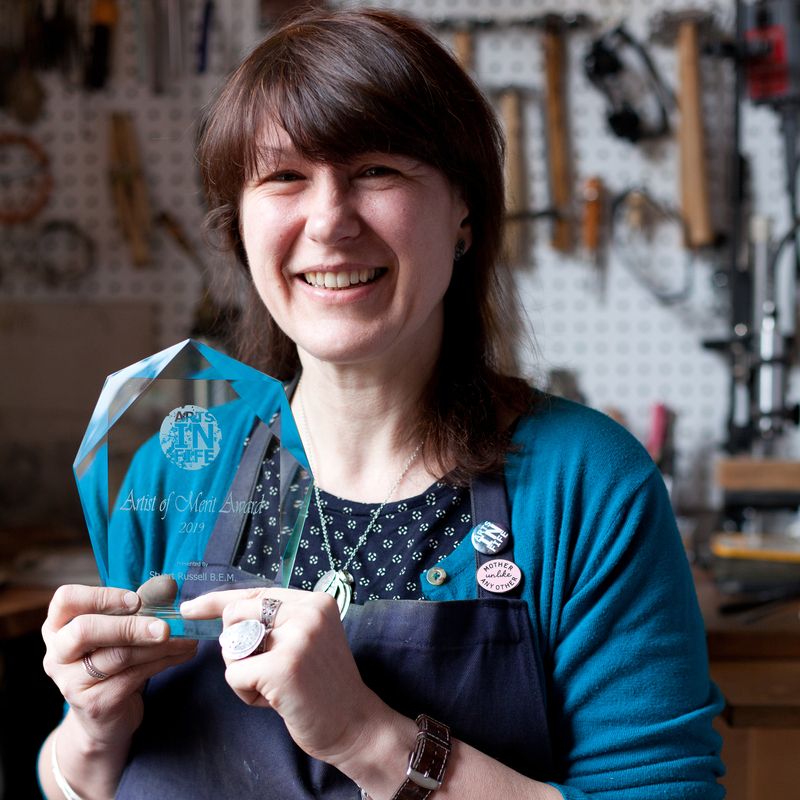 I’ve won an award – Artist of Merit 2019 from Arts In Fife. I was presented with the award earlier this year by nationally recognised artist, Stuart Russell. Stuart’s project Arts In Fife gives a voice to great local artists like myself and aims to award outstanding creative merit across the Kingdom. The scheme sees one stand-out artist rewarded for their efforts each year until 2020. The awards are in place to support individual artists in their practice and to celebrate local art and creativity within Fife. This year I’ve been given the accolade of artist of merit for my creativity and work with recycled matertials. As you know, I work with salvaged antique sterling silver teaspoons which I cleverly re-imagine and transform into items with a new beauty and charm: dusty heirlooms from one generation are cleverly reinvented for the next and each piece is meticulously handcrafted with individuality and uniqueness in mind. I’m originally from Yorkshire, where I grew up in Leeds but I moved to Scotland after finishing my university studies. Initially living and working in Edinburgh I eventually settled in Fife with my partner and now have a studio at home atop a cliff overlooking the Firth of Forth with views out to the Isle of May and Bass Rock. Daily walks on the beach are the inspiration behind my main jewellery collection. Entitled ‘Echoes’, the collection focuses on elements of the coastal landscape that surrounds us. Textures in rock, the patterns in sand, the ripples in water, directly inform the process and design of each piece and every item is meticulously handcrafted from the bowls of antique sterling silver teaspoons and 100% recycled EcoSilver. The stems of the teaspoons are not discarded. 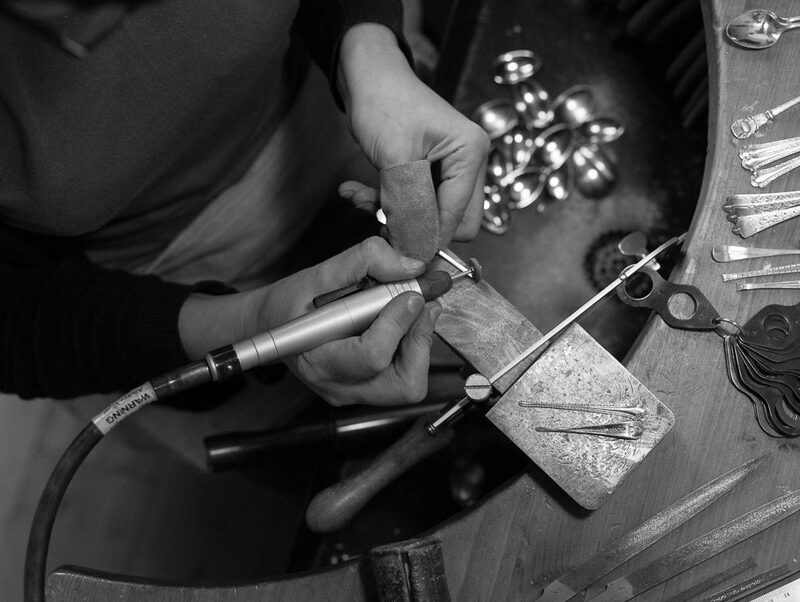 Often beautifully engraved and bearing the hallmark of the original maker, these stems are formed into rings and are sold alongside small provenance tags that outline their history – the silversmith as well as the city and year in which each individual teaspoons was assayed (usually Sheffield, Birmingham or London). My connetion with Arts In Fife started a few years ago when I was interviewed by Staurt for his Arts In Fife podcast. You may remember me blogging about it a while ago. I talked to Stuart about my passion for working with recycled materials and at that time I was producing a range of stationery, accessories and decorations, as well as my jewellery. If you’ve been following my progress online for the paat few years, you’ll know that there’s been a huge shift in my work. Since the interview my work has evolved considerably and I now solely work with precious and non precious metals creating jewellery and small sculptural pieces. I sell my work online from this website as well as directly from my studio, but my work is also available from galleries and shops throughout the UK. Since 2015 I’ve returned to Yorkshire in April each year to take a stand at one of the UK’s most successful home and gift trade shows – The British Craft Trade Fair in Harrogate. I’ll be attending again this year in a few weeks time where, alongside my three main salvaged silver jewellery collections, I will be launching my new collection of Top Brass Lapel Pins made from recycled industry brass offcuts. I’m really excited about this and hope sales will go well, so that soon my pins will be available from shops and galleries throughout the UK. I’m always on the look out for new stockists and exhibition opportunities and I’m branching out this year and will also have a stand at Scotland’s Trade Fair at the SEC in Glasgow in Autumn. This will be my first time exhibiting at this trade show, so I’m not sure what to expect, but I’m looking forward to getting lots of orders and new stockists in the run up to Christmas. This entry was posted in News & Events and tagged Antique Silverware Rings, Arts In Fife, Awards, BCTF, Brass, Brass Pins, Echoes Collection, Podcasts, Recycled Brass, Spoon Jewellery, Spoon Rings, Trade Shows.